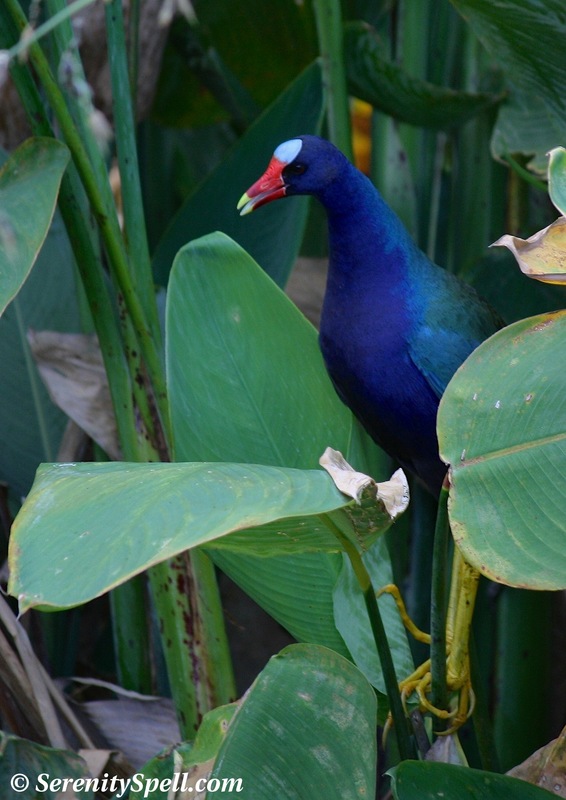 Purple Gallinules are one of the shyer creatures of our wetlands, and to spy one is a fun and colorful event. Even if you’re a sly watcher and/or photographer, they’ll quickly flit into the dense marsh vegetation when they sense your presence…. It’s ironic, being as shy as they are, with such bold coloring. But it’s always a joy to spy these purple, blue, and green gems — especially so for me, as they’re all my favorite colors, wrapped up into one bright little bird. These lovely creatures live in the freshwater marshes of the southeastern United States, as well as in Central America and the Caribbean — although they have turned up in the northern states and southern Canada, and even in parts of Europe and South Africa. There’s no mistaking this medium-sized rail, with its purple-blue plumage, green back, pale blue forehead, white undertail (of which I’ve caught more than one glimpse), bright red and yellow bill, and long yellow feet. The juveniles sport blander, brown colorations. 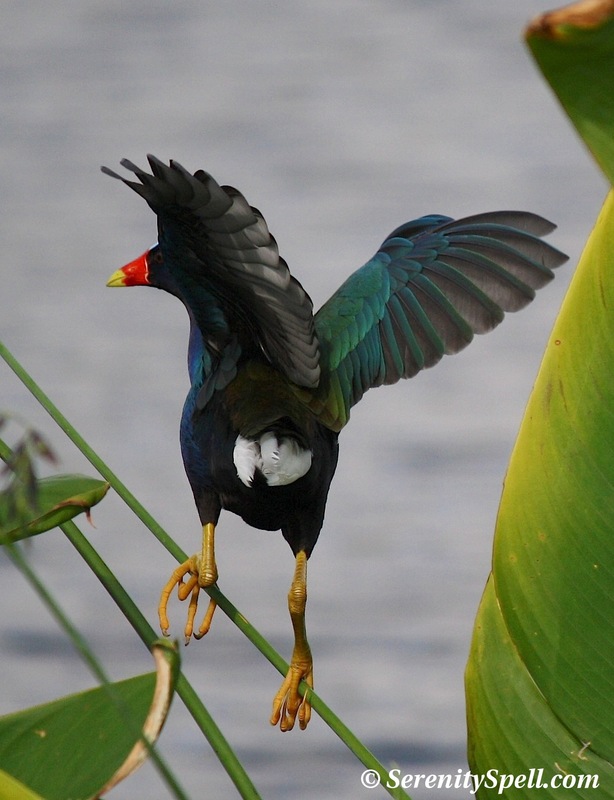 The gallinules’ huge legs make them awkward fliers, so short bursts of activity are their mode of transportation — or swimming like a duck if they’re not navigating the marsh with those dangling legs. They nest in floating constructs in the mashes (although I haven’t spotted many — they’re quite well hidden), laying 5-10 eggs. Fantastic bird & great photographs! I am in love with this sweet birdie!! everything in her is amazingly beautiful. I agree… She’s a complete gem! I stop everything when I spy them, dead in my tracks, hee! Oooooo. I am so jealous. On one FL vacation, I went on a purposeful search for one of these birds. Never found one. What exquisite photos! Love it, love it. Such a beautiful creature! Really? That’s so funny! I’m glad you got to see them, albeit online! (But I’ll say HI for you next time I see them…) They really are amazingly bright little gems — and seriously shy creatures… Can be hard to spot, though. Even when I know where certain ones tend to gravitate, they tend to run and hide in the dense vegetation at the soonest sign of alarm (and believe me, it doesn’t take much), be it another bird or *me*! I hope to visit FL in June briefly. Perhaps I will try again to see one in the wild. One of my faves. I just visited a nearby preserve last night… And spied a few of these pretty shy guys, again. 🙂 AND just missed several of their babies by a few seconds, drats. I hope you do make it down, and are able to explore some of the more wild places!! Oh my gosh, what a stunning bird. And your photographs are always so amazing. JUST SO VERRRRRY FANTASTIC PICTURES OF BIRDS. i THINK YOU ARE A PROFESSIONAL PHOTOGRAPHER!!! ps Thanks for all you encouragement! You just keep inspiring us. It is soul satisfying to visit your blog. Thanks so much! 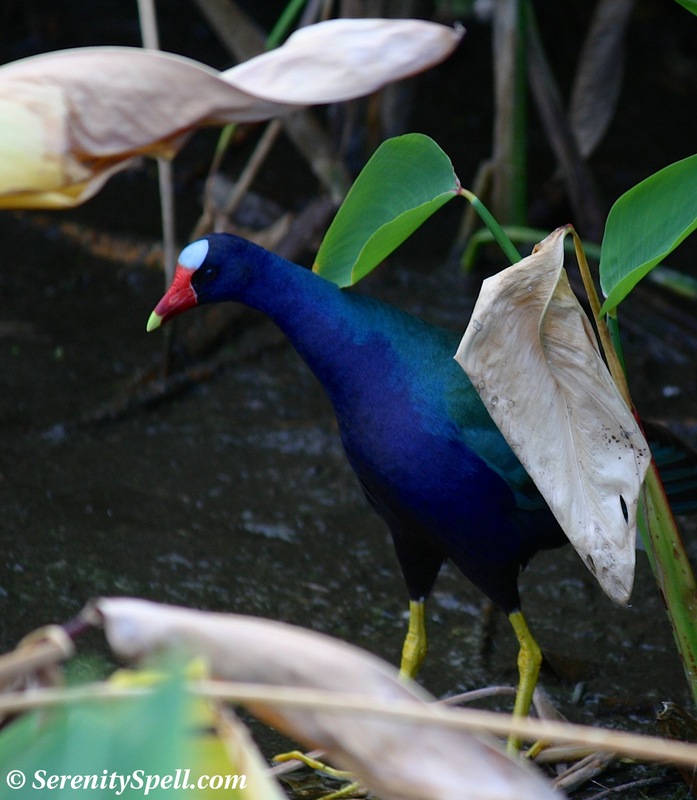 These guys can be sneaky at times, hanging out at the edges of dense marsh vegetation… Their brightness really does *pop*, even in our tropical setting. They’re such curious little critters. 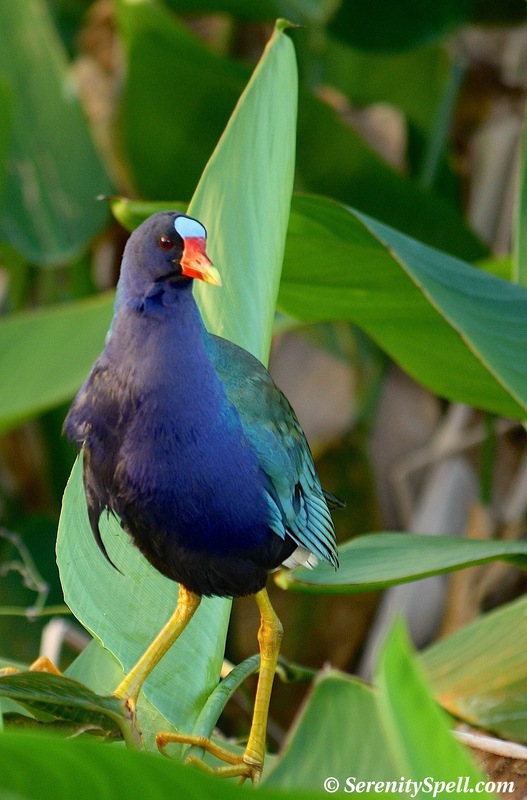 Everyone should see a purple gallinule. So i gave you a Bean’s Pat on my blog today. 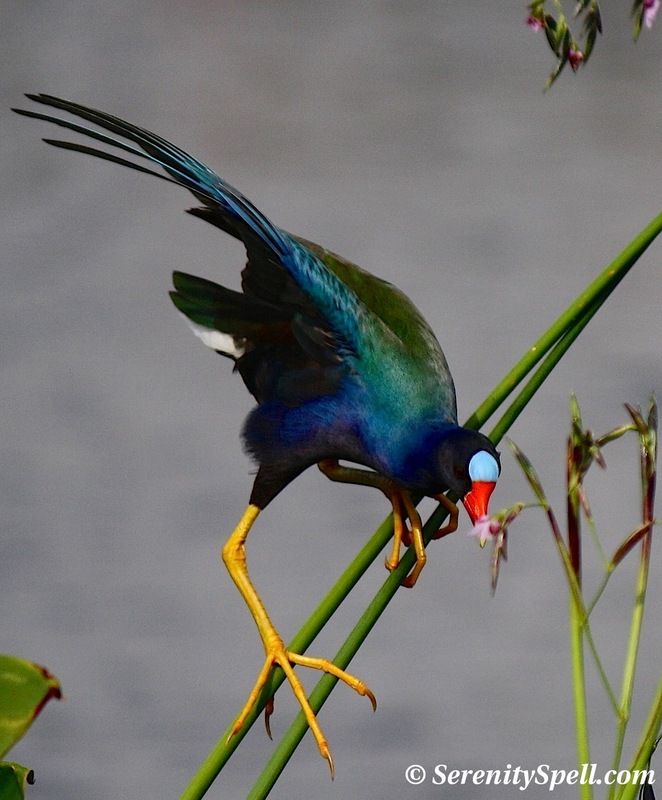 Thanks for sharing your wonderful photos of this awesome bird. Thanks so very much!! ♥ I agree — and I always stop everything to stare at these lovely gems. I looked and looked for one on Texas’ Gulf Coast, where they are found. But I had to go to the Everglades to finally add one to my life list.